This is a lovely cake. Don't be put off by the long list of ingredients, it is quite easy to make. It will last for a while, if kept in an airtight container or wrapped in cling-film. I sometimes freeze it in smaller portions wrapped in a cling film/aluminium foil. I am not sure where the recipe originates from, it is one of those recipes that you collect over the years and everyone has a similar version of it! I have tweaked it a bit to suit our taste. I don't ice it, because no one likes icing in our house, they just peel it off and discard it! 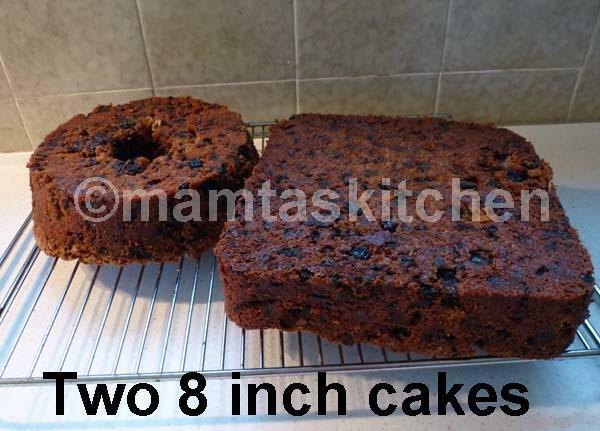 This amount makes one deep 8 inch cake or two 7-8 inch round or square standard cakes, as shown in the last picture. 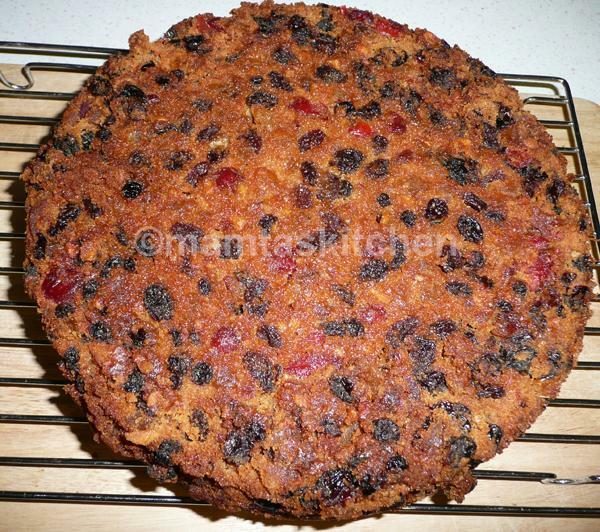 When making smaller cakes, reduce cooking time to 2 hours. 125 ml. brandy or Cointreau. Brandy is traditional. I use Cointreau or a mix of both. 5 standard/medium eggs at room temperature and lightly beaten (1 standard egg weighs roughly 53-63 gm. 2 tbsp. milk (you can add 1-2 tbsp. more, if the mix looks too stiff. 20 cm./8 inch or 10 inch/23 cm. non-stick, greased tin, or line the tin with a greased baking paper. I tend to use a sprig-form tin, where base is detachable. * In place of all these, you can have, 1 kg packet of mixed fruit of good quality. But I prefer to make my own mix. Place all fruit in a bowl and pour brandy/Cointreau. Mix. Leave overnight. Beat butter and caster sugar until creamy/fluffy. Add and beat in brown sugar until fluffy. Beat in eggs until fluffy. Beat in all the essences, salt, mixed spice, milk & baking powder. Sift in flour and fold it in. Add fruit mix and fold it in. The end consistency of the mix should be stiff. Place in the cake tin and bake at 150˚ C, for 3-3 1/2 hours in the centre of the oven. Oven times vary, so check in 2 1/2 hours and then every half hour. Take out of the oven and cool for 5 minutes. The edges will shrink a little, making it easy to ease it off. Gently ease it out of the tin and cool on a wire rack. When completely cold, keep in an airtight cake tin/container. This cake will last quite a while.